Now there is a super Spider-Man On The Street Mouse Pad. Now your desk at home or the office can show the love of Spider-Man because this mouse pad shows that your like the Marvel superhero. 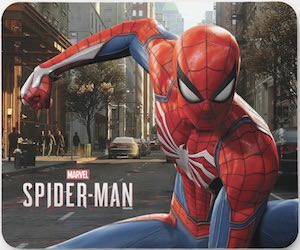 On the mousepad you can find a city and on the street you can see Spider-Man and he looks nice and big with next to him his name and the Marvel logo. The Spider-Man mousepad is 9.25 x 7.75 inches and has a non slip back so that you can use it for even more active mousing like when you play computer games. So get rid of that plain and boring mousepad and give it some superpower.